So, I'm finally getting back to my blog after a "brief" intermission. On Thanksgiving Day my mother was put on a Life Flight plane and flown from Missoula, Montana to Houston, Texas for emergency surgery to repair her aorta. My dad went with her, my brother went on Thanksgiving day, and I followed the next day. The surgery to replace a section of her aortic arch went very well (had a world-reknown topnotch surgeon!) and there were only a couple of days of high level stress! Aside from some minor issues with med reactions, she has been steadily recovering, is back home now, and is doing very well. There were a few stressful days for my parents when they weren't sure whether they would be able to get on a plane to fly home because her picture I.D. was wandering around somewhere in the UPS "overnight express" system--and my mom was more than ready to get out of the hospital and back to Montana!. Luckily they had enough documentation to get through security and made it home. I got home just in time to hang some of my work at The Beaded Pony here in Stevensville and to be there for the opening reception on First Friday. There were a good number of people through to view my work, and I even sold a piece which was very exciting. It was one of my favorite pieces called "Copper Leaves Dancing" and I know the buyer will enjoy it in their home as I have enjoyed it in mine! I really appreciate the opportunity to show my work even if there aren't many/any sales, but it is nice to sell something once in a while! I also sold a small piece at the Stevensville Art & Sculpture Society (SASS) holiday art show, and the ornament I made for the Art City gallery in Stevensville recently sold. 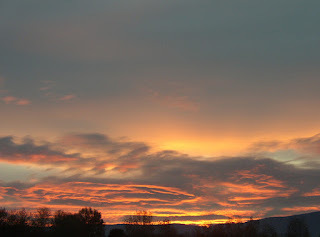 There is a new gallery in Stevensville called "River's Mist" on Main Street and I have contacted the owner and will be showing my work there as a featured artist for the month of May, 2010. This is a really lovely gallery with a great mix of quality artwork, and I am pleased that the owner has agreed to display my work. I look forward to creating some new pieces to show in this great space. I just finished the piece that I showed pictures of in my September 13 post (in progress) and it turned out really nice. I like the quilting and beading, but am still trying to convince myself that it is enough. It is always a debate with myself as to whether or not I am done embellishing a piece or if it needs something more. I haven't put the sleeve or label on yet so there's still time!! When I have the pieced photographed I will post the finished work. I also finished a couple of pieces for my recent TARTS (Textile Arts) class on using fusible web as surface design on quilts. One pieces uses foil on the web to create webby-looking metallic color and I did some 3-dimensional design on this piece. Originally I was going to cut up the quilted piece to make some ornaments out of it, but ended up twisting strips and attaching them to the base so they arc up over the piece. Hard to explain, but I will get a picture of it and post it here. It is in black, white, and purple. 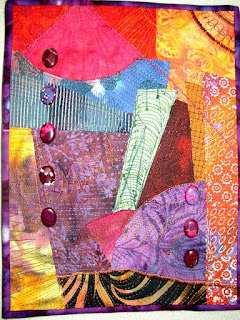 The other piece uses Pearl Ex Powder to color Misty Fuse (just shake a 1/2 tsp in a baggie with the piece of Misty Fuse) and then I adhered it and quilted it to a quilt. The powder I had was a bronzey/coppery color and very pretty over the black fabric that I put it on. 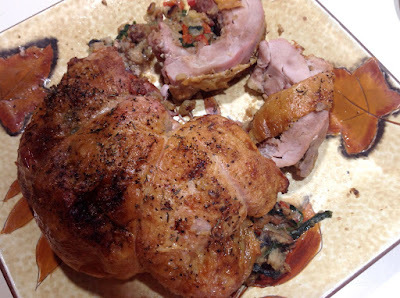 I quilted a feather medallion centerpiece on it and it creates a very pretty relief and has a nice sheen to it. Once again, when I get a good picture of it I will post it for you! I apologize for not having any pictures at this time, but I will get them soon! I'm sure you are all as busy as I am this time of year, and having a seven year old there are much more fun things to do this time of year than messing around with digital photos on the computer! My son and I have been having a good time making beaded snowflakes. I took him to The Beaded Pony for one of their short workshops and he learned how to create them. We bought some extra wire forms and have been busy making many different patterns and designs. It is fun to see what different beads do and how different combinations look. There are as many possibilities for bead design as there are real snowflake patterns! We have talked ourselves into parting with some of them for gifts, but are keeping our most favorites of course. They will be this year's addition to our Christmas ornaments. I have made something new for the tree every year since Michael was born, and in recent years he has helped. I wish you the very, merriest Christmas and a truly Happy New Year! May you be blessed with good health, happiness, and financial security. Create, imagine, or dream every day. It is good for your soul. It has done mine wonders!! I thought better put some dates on here for my "holiday" venues so that all you local friends can try to see my pieces on display---and maybe considering buying something? 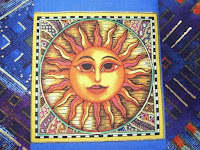 Art quilts make great gifts! November 22 (Sunday) - Art City Gallery, Main Street, Hamilton - Holiday Open House 2pm-5 or 6pm - Several of my pieces will remain on display at the gallery. December 4 (Friday) - The Beaded Pony, Main Street, Stevensville - Solo Exhibition - Evening Reception - Exhibit will be on display through December. I recently heard from another juried fiber art gallery show that I attempted to enter, and as has been the norm, I did not get in. I had sent in three pieces to be considered and I guess they were not competitive enough. This particular show received over 250 entries and accepted 50, so I am definitely not alone. And it probably won't be the last time I don't get in to an art show! I am still waiting to hear from the Art Meets Science exhibition as to whether any of those entries are accepted. I should hear in the next few days. The time waiting is always a bit painful--particularly when it ends in a "decline" notification! 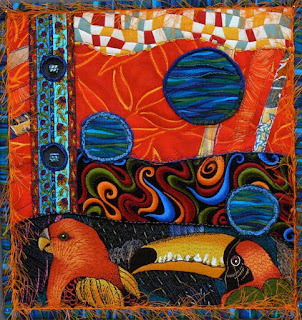 This is a SAQA (Studio Art Quilt Associates) sponsored show so only SAQA members are allowed to enter, but there are a great many of those! Halloween was fun with my 7-year old this year. He wanted to be a Ninja and I talked him out of that by suggesting one of his favorite movie stars----Groucho Marx! I made a big brown cigar, some felt eyebrows and mustache, and found some wire frame glasses at the thrift shop. I put him in a white shirt, black pants, a large suit jacket, and a skinny tie. He looked really cute and funny, but he was rather disappointed that none of the kids knew who he was! His teacher knew immediately and told him a story about her parents taking her baby sister to a baseball game and being asked by Groucho Marx to let him hold her and she ended up watching the game with him. Michael was impressed. Even most of the parents are too young to know who he was (I'm one of those older moms!). I heard a couple of them agreeing that he must be the guy from the Monopoly game (I think they were referring to the banker). When I took him to a community event on Halloween most of the adults running the games and many of the people with their kids or grandkids knew who he was and loved the costume. He just wanted to take it off----the eyebrows itched! He has to put it on one more time so I can take pictures since I keep forgetting to get out the camera when he has it on! 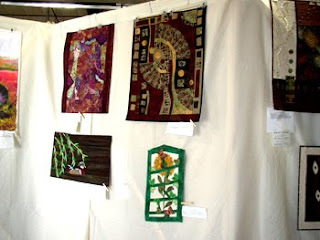 A friend of my mom's went to the Pacific International Quilt Festival (PIQF) in California where I recently had two quilts exhibited. She sent me some pictures of my pieces hanging there. I was very disappointed to see that they were both hanging at the bottom of the panels they were on, near the floor. 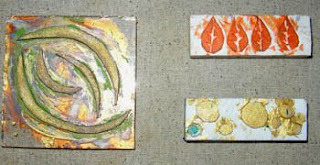 It is my experience that when pieces are hung underneath other pieces and near the floor they are virtually invisible to most passersby and get very little attention. They just do not get good light and are below eye level so people don't notice them. It is really too bad as they both have wonderful beading and quilting on them that if they were hung at eye level would catch the light and show well. I did receive a very nice e-mail from a woman I didn't know from Seattle who also went to the show and did manage to notice my pieces and really enjoyed them. She then checked out my website and blog and was very complimentary about my work. I thought it was very nice of her to take the time to share that with me and I really appreciated that she took the time to e-mail me. The judges' comments on both of my pieces were also very complimentary and I was very appreciative of those as well. One of these days they'll be good enough to actually win an award at one of these shows! I need to get a binding stitched on my latest piece so I can move to the next one! This week we had the second meeting of the art discussion group that I recently organized. We met at a member's beautiful home and had a wonderful time visiting, sharing and doing an interesting fabric project. The project involved spraying spray paint onto water in a tub and then laying a piece of fabric over it to pick up the paint. We used many different paints including metallics. The results were varied and definitely interesting. Sometimes the paint kind of bubbled up and didn't adhere to the fabric and then tended to flake off. On other pieces the paint was thinner and seems to be pretty well adhered to the fabric. One suggestion was to overlay black netting to help contain the paint, although there might still be some flaking. The colors and patterns were wonderful. The movement of the water causes wonderful swirls and motion in the pattern of paint. This is an easy project and with some very usable results. A recent project for my textile arts class was to use Elmer's Blue Gel glue to draw on fabric creating a resist. Let it dry and then use thinned fabric paints to paint between the lines however you wish. 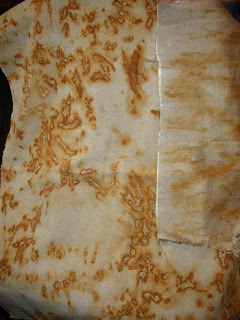 Let that dry and then heat set it using a press cloth to protect your iron and pressing surface. Then let it soak and occasionally agitate it in warm/hot water to dissolve the water soluble glue (I had to kind of rub and run hot water over it to get the residue off completely). The pieces I created came out really beautiful and I have already finished (quilted) two pieces which I really like. I don't have pictures at this time, but will post them soon---check back! 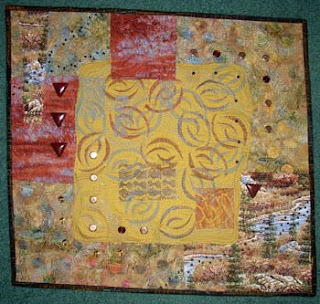 Please check out www.saqa.com and view the auction quilts that will up for sale starting September 10. This is a reverse auction so they start at a high price and it goes down each day, with a low of $75 on the last day. 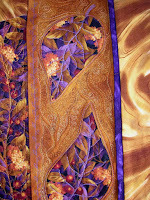 There are some beautiful pieces by extremely and talented, and some well-known, fiber artists. My donation never did show up and appears to have been eaten by the U.S. mail service. It was a lovely little piece so I am rather sad to not have it included in the auction to help raise money for this organization. 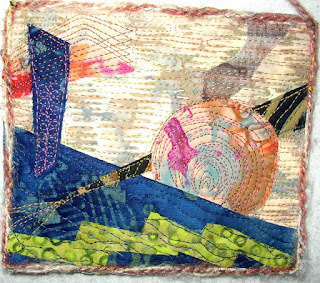 This group works to promote fiber art as an art form throughout the world through it's continuous exhibitions and publications and any other means of promotion. I have sent off my piece entitled "In A Heartbeat" to travel with the Fibrations exhibition starting September 11 in Cody, Wyoming at the Yellowstone Quilt Fest. I am honored to be included. Earlier this summer I had promised some pictures from our quilt show at the end of June and I finally remembered and got some of them formatted to show here. 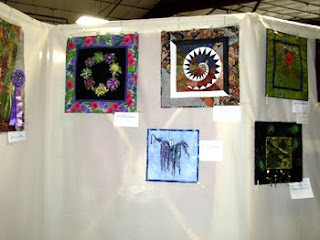 These are all from the Art Quilt and Landscape/Pictorial Quilt categories at the Bitterroot Quilter's Guild show. 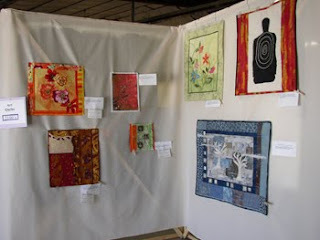 We had a wonderful display of art quilts in both categories and I was impressed with the quality and variety of these pieces. 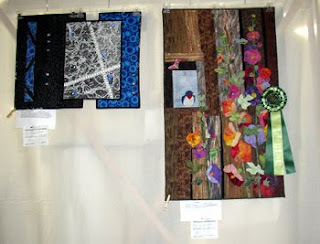 I was honored to received the first place ribbon in the Art Quilts and 3rd in the Landscape/Pictorial category. 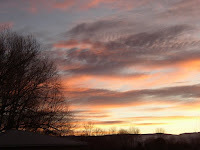 I apologize for the quality of the pictures as my digital camera isn't the best, but you can get an idea of the wonderful display we had. Enjoy! Great Blue Heron piece is done by Mickey Frissell, my mom. Geisha is hand appliqued onto the background by Jaime Grant. Color in my picture does not do it justice---it is a beautiful background and wonderful workmanship as is the norm for Jaime! I don't know how many other quilters are gardeners, but I suspect that many are as we all have an affinity for color, and many of us are inspired by nature. It is difficult to balance studio time and time to maintain and enjoy gardens, yard, and the great outdoors. Throw in a six-year old and you've got a real limited amount of time for working on quilts! I have the additional problem of having my sewing room on the northwest corner of the house where it gets a very hot afternoon sun on two sides and becomes rather warm until the sun goes down. 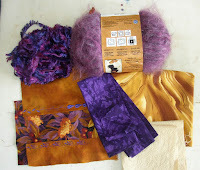 All this to say that I have done little or no fiber art creating in the last couple of weeks. Gardens full of weeds forced me to give them attention and now at least the vegie gardens look very tidy---but as you gardeners will know, that won't last long!! We've been lucky enough to have thunderstorms with rain in recent days (that ought help those weed out!). What a blessing here in Montana where it is usually quite hot and dry in August. I am enjoying the cooler air and not having to water the gardens as frequently. 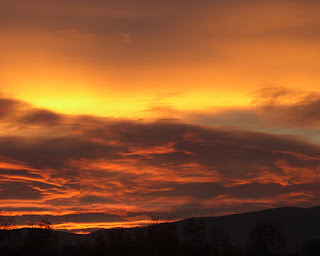 There have been some forest fires in the area and the evening skies with the smoke makes for some very inspiring sunsets. In case you haven't experienced this phenomenon where you live, the skies turn very red near the sun and shades of pink all the away around and to the east. Not sure if the full moon will be visible tonight with the overcast skies, but if it clears a bit, it might be beautiful sight in the red tinted skies of the evening. Can you imagine it……??? What I have done in my studio in recent days is supervise my young son in making a small quilted wall hanging he wants to enter into the Ravalli County Fair this year. He has decided on two rail fence and two log cabin blocks and is working on pressing fabric and cutting the strips out. We should be ready to sew and this year I'm thinking of letting him try to do that by himself instead of sitting on my lap. He has very good coordination if I can just keep him focused and paying close attention to what he is doing. Six year olds tend to be easily distracted! Still no sign of my 12"x12" SAQA auction donation quilt. It is sad to know that it is gone and not know that at least someone is enjoying it on their wall somewhere. I regret that I didn't send it in earlier so that maybe I would have had time to create another one to donate by the deadline. Next time I will definitely use UPS where I can track my package. This weekend we picked over 7 quarts of huckleberries in one morning. I made a pie, but froze most of them. My son contributes very little to what actually comes home in the buckets, but he sure enjoys eating them. I hurried home so that I could get to our local bead shop, The Beaded Pony, to see what the bead traders had for sale. They had five tables of strings of various kinds of beads and I bought more than I should have. I got a couple of beautiful strands of stones and some shell beads. They had much more that I would have been happy to take home, but you gotta stop somewhere! Tomorrow I will be helping to judge the Stevensville Creamery Picnic Kiddie Parade. Not quite sure what that means, but they need some help and I'm sure it will be fun. The Creamery Picnic is a yearly festival and is usually a very fun event. They have a larger parade on Saturday and then lots of activities going on in the park and downtown. I'm hoping to stop at the local library for their book sale where I usually pick up some good stuff for a bargain. 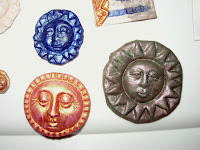 Here are some pictures of the fabric stamps I created (discussed in previous post) and the pieces I used them in. One of the quilts is completed and the other I am in the process of quilting. 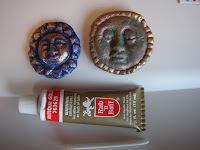 I used various paints including Lumiere, PRObrite textile paints, and inexpensive acrylic paint. 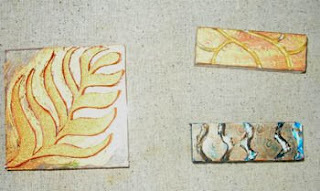 The stamps are made from foam sheets cut up and attached to plexiglass, and art erasers that are carved. I understand that the erasers are available in larger sizes and I plan to look for some of those. This size was quite small and limited the complexity of the stamp design. Both stamps worked well though and were very easy to create. The foam sheets are really easy to draw a design on, cut it out, and then use E6000 adhesive to glue it to the piece of plexiglass. A clean, fun, easy project to use to create your own piece of fabric unique to you, and then use that fabric to create an absolutely original fiber art piece! A week ago my sister was visiting for a couple of days and my mom encouraged us to do some fabric rusting. Some pieces came out and some didn't but I think there is definitely some usable fabric. Here's a picture of a piece of Osnaburg that we wrapped around a rusty tow chain and left for 24 hours in a black plastic garbage bag on the deck. The smaller piece is handmade Thai silk and I believe I wrapped it around some steel wool and metal shavings. Both of these pieces are definitely good additions to my stash. On Monday, I got together with a small group of fiber artists and shared some art, some techniques, some ideas, and some enthusiasm. It was nice to talk with other women who are as interested and intrigued by all things fiber art as I am. We all have different ways of working and certainly the pieces we produce are all different (original! ), but still we all have an enthusiasm for learning more and finding out about what others are doing and maybe picking and choosing the things that might work for us. 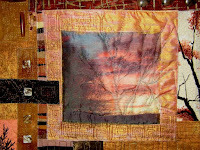 The group includes artists doing realistic pictorial, abstract, multimedia, and mixed technique work, but mostly with a base of quilted fiber. There also all stages or levels of knowledge about working with fiber within this group---some are rather new to it and others have years of experience to share. But each person has a fine grasp on art in whatever form they produce it, and everyone in the group creates work that inspires me and gives me an even greater appreciation of the range of possibilities in this realm of fiber art. I recently wrote about the small quilt (12"x12") that I shipped off to the Studio Art Quilt Associates online auction and posted a picture of it. Unfortunately, the piece never arrived at the SAQA destination and appears to be lost in the mail, or possibly stolen out of the mail. I have been in touch with the Executive Director of SAQA and she is keeping an eye out for it in case it does happen to show up by some small miracle, but I'm not very optimistic about that possibility. It was nice to find out that it was her husband who purchased my piece from the auction last year for his new office, and that she enjoys the piece when she sees it hanging there. It is always a morale booster to find out that someone (particularly someone who isn't your friend or relative!) really enjoys your work and believes it to be art worthy of hanging on their wall. And if they still enjoy it a year down the road, that is even more encouraging! I was really looking forward to contributing to the organization in this way again this year and am disappointed that my work will not be posted with all the other wonderful pieces that are on the website, but I guess I'll have to deal with it! Please do visit the site at www.saqa.com and view the online auction pieces that are posted there. There are many truly wonderful works. The auction begins in September. The dry, hot weather here has created a truly ravenous and destructive population of grasshoppers that are eating their way through my gardens. A few of my perennials are stripped bare and will likely die, and the vegetable garden in the backyard has been cleared of any green beans, most cucumbers, and most of the winter squash plants that were coming along nicely. Hardly motivates me to go pull the weeds that are ever increasing in those gardens! The last few days has brought some thunder showers but the moisture has not seemed to effect the grasshopper population. Every time you walk outside they are popping and bouncing around all over the place. And I have a six year old who thinks they are really cool and has collected and regularly feeds at least a dozen of them in a little terrarium in his room! Boy is the summer going fast! Soon our County Fair will be here signaling the end of the summer. My son will start First Grade and I'll spend more time in my studio and less outdoors. It's a transition I look forward to with mixed emotions. I love the quiet, uninterrupted time in the studio, but time spent with my son is precious and fleeting. I think he has grown half a foot since this Spring and none of his pants fit (thank goodness for shorts in the summer!). Tomorrow we are going bowling with a friend and her grandson and I'm going to cherish the outing. Watching the two well-behaved and charming young men (6 and 7 yrs old) is fun and makes me smile. They are so enthusiastic about everything. Give me some of that!! 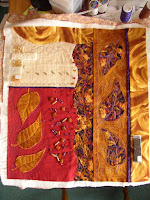 I am currently working on two pieces for my next textile arts class. The project this month involves creating and using stamps on fabric. The kit included a fabric marker to be used with the stamps, but I didn't think it worked real well with the stamps, so I used mostly paint for my pieces. One kind of stamp we made was by drawing a design on and then carving it out on a small rectangular eraser. The other was using craft foam (foamie sheets) by drawing out a design, cutting it out, and adhering it to a small square of Plexiglas using E6000 craft adhesive. I used fabric paint (Lumiere, plain old craft acrylic, and PRObrite textile paints) to stamp onto some fabric and then used those as feature fabrics in my pieces. One piece I have quilted using a lot of the pattern of one of the stamps as a quilting design. Then I added some beads and it's done. The second piece is made with some very bright fabrics and bold prints. I have just started quilting it and so far I like how it is going. It is a really good one for using some of my beautiful threads. I'm using black in the bobbin which shows up vividly on the lime green backing. So far I have used mostly YLI threads, both solid and variegated, and they stitch beautifully. 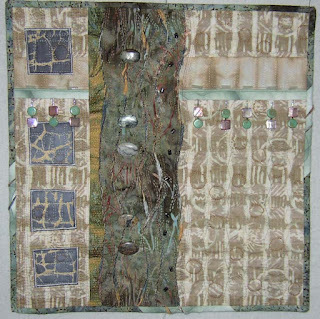 One of my pieces has been accepted into a juried show of small fiber art pieces sponsored by Studio Art Quilt Associates (SAQA) called "Fibrations". The show juror was Katie Pasquini Masopust who is a very well-known art quilter. 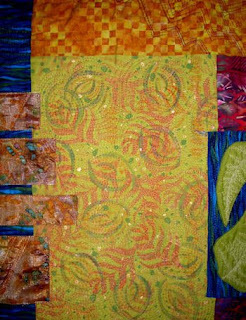 The quilt is "In A Heartbeat", which is a piece that has pinweaving on it, and it will be traveling with this exhibit from this September through July, 2010. 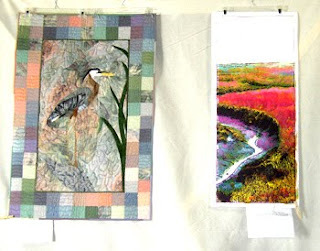 The venues include the Yellowstone Quilt Fest in Cody, WY, The Rocky Mountain Quilt Museum in Golden, CO, and two large quilt shows in New Jersey and Virginia. 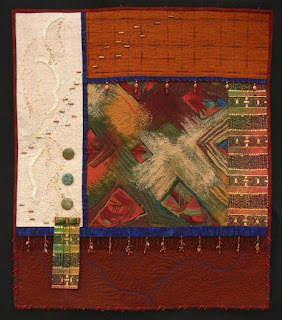 There are 48 quilts in the show with some very exciting artists on the list so I believe it will be a good show. It is exciting to have been accepted into the first SAQA show I have attempted to enter. My sister is visiting this weekend (actually visiting my parents who live nearby), and my sister, my mom and I are planning to do some fabric rusting tomorrow. I have gathered up some rusty nails, washers, etc. and some potentially rustable fabrics and I'm ready to give it a try. My mom has done this process before and used some of the fabrics in some really great art pieces, so I'm anxious to see what we can come up with. My sister works full time and doesn't get into her workroom as much as she'd like, but I'm sure she'll be able to use these fabrics in her work, whether that is the clothing she makes or a great art quilt. She makes a lot of neat pieces of clothing and I think she can use the rusted fabric with the kind of fabrics she likes to use, and do something beautiful with it. She's always picking up great silks, rayons, wools, etc. either online or wherever, so her stash (or "fabric collection" in the current lingo! ), is full of texture and rich color. She's made me some jackets and tops that are the most sophisticated items in my closet and really fun to wear--which I do whenever I get the chance! I just finished reading a Nicholas Sparks novel, "The Rescue", and really enjoyed it. If you like well written romantic stories (I had a good cry! ), these are for you. He's written lots of books and I guess he's very well known---I'm not one who keeps up with the New York Times best sellers so what do I know! A friend passed a bunch of them on to me that she needed to get rid of so I thank her! Our quilt show is over and it was a great success. It was a beautiful display with a good variety of quality workmanship. I was fortunate enough to get three ribbons and many, many compliments on my work. 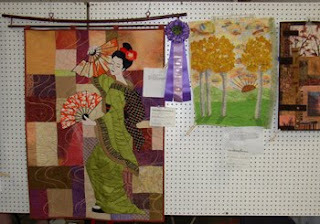 I was most proud of the first place ribbon in the Art Quilts category. There many beautiful quilts submitted so I was honored to get that ribbon. It was on the piece that I had made for the Beaded Pony bead contest earlier this spring. I didn't sell anything, but I made a couple of contacts that might lead somewhere eventually. It was definitely a worthwhile activity and I enjoyed participating in it. 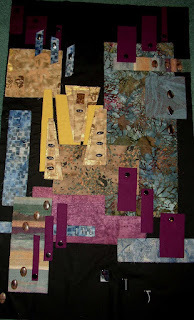 Here is a picture of the monochromatic quilt I created for the guild's Challenge, and for which I won 2nd place. It is approximately 10"x14". 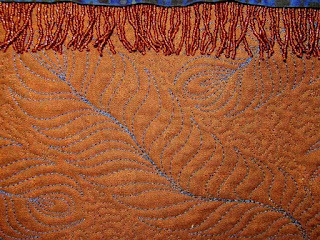 The leaves were done by sandwiching Timtex heavyweight stabilizer between fabric and stitching the leaf shapes and veins, then adding beading to some. I used a green marker to eliminate the white Timtex that showed on the edges after they were cut out. The center arched "window" I cut out after I had heavily quilted and satin stitched around the shape to make sure it was well stabilized. Then I sewed the bias strips that form the lattice to the back and added a piece of very light green organza behind it. I strung a mixture of beads in with the dangling leaves so they all kind of sway when you move the piece (or if the wind is blowing as it was when we took this picture!). I was very happy with how the piece turned out. I have had one inquiry as to whether or not it is for sale (of course it is! ), but haven't heard back as to whether they want it or not. Let me know if you are interested...! 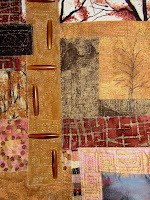 I just sent in my contribution to the SAQA (Studio Art Quilt Associates) silent auction which is a 12"x12" piece. Here is a picture of it along with a picture of the piece I submitted last year (which sold at the tail end of the auction). You can see all of the donated auction pieces (all 12x12) at www.saqa.com. The reverse auction begins on September 10th with all pieces starting at $750.00 and going down eventually to $75.00 at the end of the auction. My piece will not be posted out there until after they take a picture of it on July 8 so look for it shortly after that. There are many wonderful quilts and some done by some very famous quilters so be sure to take a look! Hopefully the guild will make some money with the auction since everything is donated. The bidding quite often gets interesting at the end of the show so I'll be keeping an eye on it tomorrow afternoon! I worked at the show all day today and will be working tomorrow for most of the show and then meeting a friend to walk around and view it a bit. Ribbons for Viewer's Choice and the Challenge quilt winners will be posted so I look forward to seeing who the winners are. There are some wonderful vendors to visit and I already bought some fabric and, of course, some beads! This is always one of the best shows in the area (this year is no exception!) and I'm proud to be part of it. I have to get the picture of my challenge quilt from my dad so I can post it here for you. Will try to get that up in the next couple of days. They indicated that it one a ribbon but I don't know quite what yet. I don't know exactly how they judged them but I think there are several ribbons being awarded. It was a very fun challenge to participate in. Some of the other pieces are really wonderful and I'll try to get some pictures of them tomorrow to post here with permission! Have to get some rest now so I'm ready to go for a long shift at the show tomorrow. Come back soon for more pics! This blog had its 1000th visitor today!!! Thank you for coming to my site. 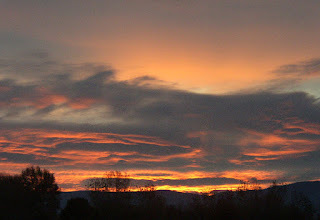 I hope you enjoy my musings and pictures. I will post some more pictures soon of my Studio Art Quilt Associates on-line auction donation quilt (12"x12") as well as some pictures from my guild's quilt show this weekend. 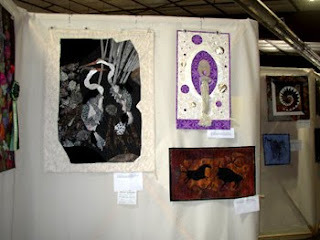 After this weekend I will also post the pictures of the monochromatic Challenge quilt I did for the show. Finishing is a Good Thing! 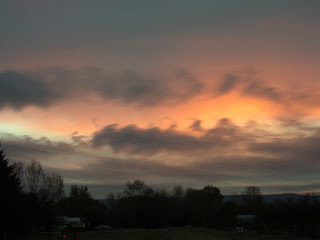 I wanted to get a new post out there for you to read, so I apologize for no quilt pictures at this time. Will try to get some on here in the next few days though! 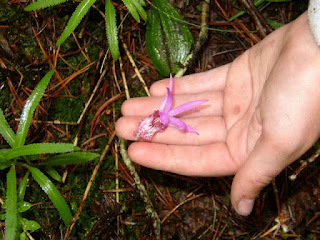 Here is a picture of a Calypso Orchid or Lady Slipper, being posed for the camera by my son. We were camping and there were lots of wildflowers in bloom. I just finished a wall hanging that is heavily quilted and has quite a bit of beading on it and I finally feel like I have a free moment. I needed to finish it in order to get it into our quilt show next weekend so I am happy to have met that deadline. I still need to put a sleeve on it (in case it should happen to sell! ), but other than that it is a wonderful testament to having a vision and sticking to it. This piece is called "Twilight" and has a large arch over a landscape. 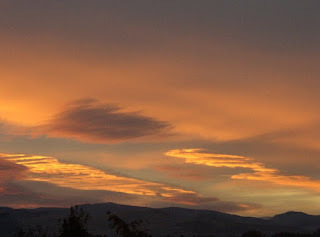 The sky and water are cut from a beautiful hand-dyed piece of fabric I bought last year in Seattle. 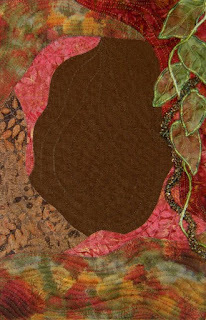 The landscape goes outside the boundary of the arch on the sides, and in the borders it is just a quilted image. It is probably hard to envision, and I am not planning to post pictures of it here until sometime down the road as I hope to try to enter it in a show or two (after our local quilt show). Some shows do not want entries to have been displayed on the internet or even in another national/regional venue so I'm keeping it under wraps for now. Sorry to tempt you then pull it away!! I sure wish someone would make a comment here as I'm not sure if it is working or if you just don't have anything to say??? I haven't had a comment in months! If you have difficulty posting a comment, would you mind e-mailing me at heidizfiberintoart@yahoo.com to let me know what problems you encounter? Maybe I have something set wrong….? I'm rather new to this, but I did get some comments when I first started the blog. My gardens are just bursting with color right now. Huge orange poppies are blooming with big purple iris among them---what a sight. In the morning light the blue flax are like neon blue and just seem to glow. Unfortunately recent rains have encouraged lots of weeds and I really need to get out there and take care of some of them in my multiple garden areas. Probably should tackle the vegie garden first to make sure the seedlings aren't choked out! My perennial hill is really sad as the weeds are now marching over the top and inching down the front side. I recently cut down some aspen trees we had planted next to this garden because they were sending out runners everywhere (nasty things!). The trees are gone but the runners are still abundant. We've read that you just have to keep cutting them down and without leaves they will eventually die. How long "eventually" is we really don't know! 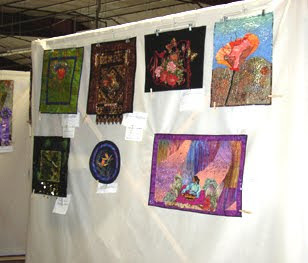 I should soon be getting my quilt back that hung this weekend in the Denver National Quilt Festival. 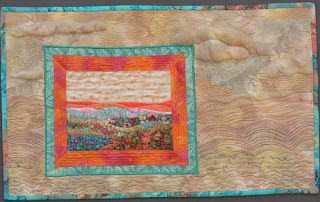 An acquaintance from the Quiltart listserv, Jan Koehn, was nice enough to take some pictures of it for me and e-mail them to me. Thank you, Jan! I completed my piece for the bead contest and entered it with one other piece (“Purple and Pleated”), but unfortunately did not place in the competition. 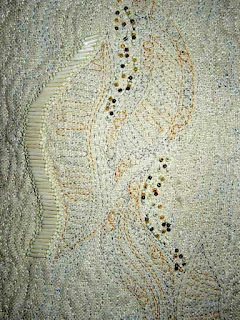 The three pieces that won are truly beadwork that is totally covered with beads, as opposed to my fiber art pieces that are embellished with beadwork allowing the fabric to show through. I don't currently plan to change my style of work, so maybe I'll have to think about whether I should participate in the bead competition next year. I enjoyed putting a lot of beads on my piece and felt that there was a good deal of beadwork on it, but I guess the judges just didn't think there was enough. I believe my piece turned out very well and I may try to enter it into some other type of exhibit/show in the near future. This piece is entitled: "Spring Thaw IV: From Winter We Emerge" and is for sale for $450.00. It will be hanging at The Beaded Pony until May 9. I did not make it to the First Friday event at which the beaded pieces were displayed and the shop had all their beads on sale because I was home trying to recover from a recently diagnosed bought of pneumonia. I am still having a good bit of discomfort breathing and I think the recovery to full health will be rather slow, but hopefully I will be able to get out and about soon. I had a bad cold prior to this and it felt like the bad congestion I had in my head just dropped overnight into my chest. Never had this before, never want it again! I am currently working on three pieces. One is the old brown tree with the dangling leaves which has been set aside for a while after attempting to quilt it and finding it rather boring and not knowing what to do to perk it up. It's waiting for some inspiration. I am also working on my challenge pieces for the upcoming Bitterroot Quilt Guild show the last weekend of June. This is a monochromatic piece that is rather small. Can't say much more than that as it is supposed to be an anonymous entry that will be voted on. The third piece is a landscape with a window type arch and it is done in blues and tans. I am currently quilting it and it is going rather nicely. This little illness has slowed the work down, but I hope to get back to it in the very near future. I also need to start on something using this month's TARTs project which is glitter, glitter glue, and a product that consists of beads emersed in glue that you can use to embellish. I don't know what I plan to do with it, but should not be a difficult project to work out. I'll likely do a small piece this time. Unfortunately, my pneumonia interfered with attending my final bead class which was very disappointing. I was looking forward to learning how to surround a “cabochon” with beads. A cabochon is stone that has a flat side that allows it to lay flush on the surface of the quilt. 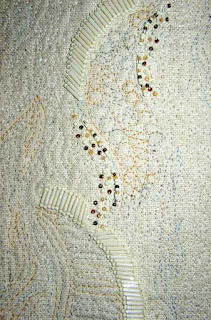 Then you can encase the edges of it with beadwork using small beads to hold it and enhance it. I really enjoyed interacting with the other students in that class as they are all enthusiastic and artistic individuals who have a lot to share and love learning and sharing ideas and their work. It is so stimulating to be with like-minded people every week. 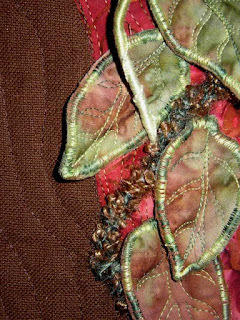 I always look forward with great anticipation to my TARTs (textile arts) classes every month, but they go so quickly and are over before I know it. I have been tossing around the idea of creating a group of interested artists who could get together every month and share what were doing, critique, discuss ideas, and just interact and enjoy the company of other artists. I'd really like some critique of my work as I never hear from anyone what they don't like about my work. It would be helpful to know this as I feel I could grow more from that. We'll see if that idea ever goes anywhere. I'm trying to decide what contest or exhibition I should attempt to enter next. There is always something coming up! I need to contact some area galleries to see if there is any interest as well. After the Bitterroot Quilt Show in June I have no other venues for my work lined up so I better get busy! I'm currently working diligently on my entry for The Beaded Pony's bead contest. Above are some rather poor pics of the work in progress from my design wall. It is going well but I'm having the usual dilemma about when to stop embellishing. I don't want to overdo the beading as I usually choose to "embellish" the fabric rather than "encrust" it with beading. I really appreciate the work of other artists who do this in their work, but in my work I like to let the fabric and quilting be strong parts of the piece. I do have to do a good amount of beading if I hope to place in the contest though---it is a BEAD contest after all! Last year I did not do enough beading on my piece so I'm hoping that this year's entry will do better. I'm hoping to hang a couple of my other beaded pieces but they won't be in the contest, just for sale. They contain some beads that are not from the Beaded Pony so are ineligible for the competition. I'd say a large percentage of my bead inventory is from there, but naturally I do make occasional purchases elsewhere when I find something unusual. Tomorrow we are taking my son to the circus as we have done the past couple of years. It is a fun family outing and he really enjoys it--as do I! Here is a picture of some of the things hanging on my design wall (I never seem to have enough space to hang the pieces I'm working on without moving stuff out of the way!). 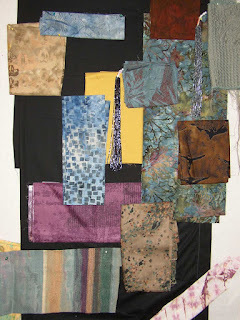 When I acquire a new embellishment, fabric, piece of trim, or whatever that seems particularly inspiring, I often hang it on my wall hoping that it will trigger an idea or become part of something I'm working on. Sometimes they are pieces to precious to put away in a drawer or a box until I have had time to admire them for a few months. Other times I am thinking they might work in a piece that I am thinking of or working on. Inspiration comes from so many sources. 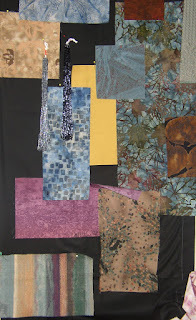 I am quite often inspired by things that I see in my yard or around my home, but many times it is a piece of fabric that the creation of a piece will revolve around. 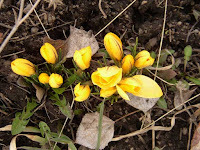 This time of year the flowers start blooming and plants start sprouting and budding. I find this inspiring for art and life. I don't often get philosophical and I don't do art with "deep meaning", but spring sure is an awe-inspiring time of year for me. I'm willing to get out of my studio and dig in the dirt to clean up my gardens and uncover those sprouting perennials that will soon be filling my gardens with colorful blossoms and attracting hummingbirds, butterflies and bees. 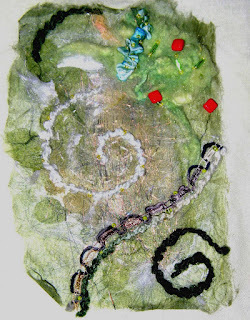 I'm sure I will be moved to create some fiber art that reflects this new life and growth. Actually I need to move on that thought as the theme for the Beaded Pony's bead contest is "Springing into new life" and the pieces are due at the end of this month. I entered one of my pieces last year and got third place in the flatwork category. This year I'd like to move up to at least second place, but we'll have to see what I can get done in the next couple of weeks. Could have done better last year if I had more beading on my piece so I will attempt to remedy that. I also have to make sure I use beads from the Beaded Pony so hopefully I can determine that from my stash of beads. Regardless of how that turns out, I will hang a couple of my beaded pieces there for the week that the shop is displaying beaded art along with the contest entries at the beginning of May (I can't find the postcard with the exact info right now, but I will try to post it here when I do!). We took my son to the huge Easter egg hunt at The University of Montana campus today and we had a great time. He got a sackful of loot and really enjoyed the whole event. Tomorrow he is going to go turkey hunting early in the morning with his dad, allowing me some time to hide his Easter treats outside so he can have another hunt at home (please don't rain!). Then in the afternoon we will go up to his grandparents house where he will likely do some more hunting! What fun. He and I have done treasure hunts for as long as I can remember. Early on I would draw pictures on pieces of paper leading him from one location to another around the house and he was very good at figuring them out, although I am no artist when it comes to drawing. Now he can read words so the clues can be riddles and hints which is much more fun. My mother helped me hang 14 of my quilts at the Rocky Mountain Bank in Stevensville on Wednesday. They will be on display, and for sale, for the months of April and May. 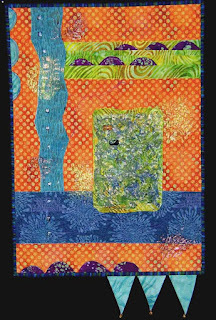 Then on Thursday I received a notice in the mail that one of my quilts, "Twist of Lime, Pinch of Purple" was accepted into the Denver National Quilt Festival. It is a juried show which means I had to send in digital images of my entries and knowledgeable jurors determine which entries they will include in the show. That show will be April 30 through May 3. 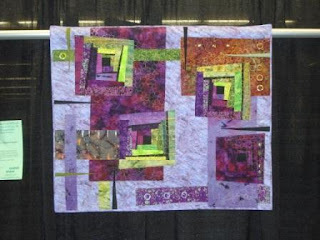 This quilt is an innovative piece using a traditional block (log cabin) as a base. I believe it will make a better statement hanging in this show than the two pieces they accepted last year. It is much bolder and more colorful. Now I have to go through the agonizing process of determining how to ship the quilt so it doesn't arrive there with folds and curling corners! We went camping last weekend to Freezout Lake and had a great time except for having to stay an additional (and very chilly) night because of a snow storm. There were probably 100,000 snow geese and more people than we have ever encountered in the nine years we have been going up there. We explored the area as is our usual activity for this trip, seeing such sites as Benton Lake Refuge, some Indian teepee rings, and of course the camels next to the highway in Fairfield (two humpers). We had a wide range of weather conditions and it was more wintery than any other year has been, but we were able to enjoy ourselves and it was a good trip. My son who is six had a great time and just loves camping in the trailer. Luckily for him he climbs into his sleeping bag and turns on his personal body furnace and stays warm all night---even without socks! I had two pairs of socks on and was still cold all night. Today I started working on a challenge piece that I need to finish for the Bitterroot Quilt Guild show in June. It is to be a monochromatic piece and each of the participants was given a piece of fabric that we have to use in the piece. Luckily the color of my fabric has inspired an idea and I'm hoping it will turn out interesting. The quilts have to be rather small (maximum of 144 sq. inches) so that will be a challenge for me. No pics of this one as it is supposed to be anonymous. My son entered a watercolor painting in the Montana Junior Duck Stamp competition so we went to the award ceremony yesterday at the Lee Metcalf Wildlife Refuge here in Stevensville. I was impressed with the whole event, although much of it was outside in their amphitheatre and it was very cold. They treated the kids really well and I think all had a great time. They got very nice prizes and ribbons. Michael received an honorable mention which is what all the kids who didn't get 1st, 2nd or 3rd get. He was at the bottom of the age range so he has years to get better. We were very proud of his effort and the quality of work he does. If we can just get him to keep working at it and practicing I think he will be very competitive down the road. I asked him if he likes painting and he said he really likes his lesson with his grandpa every week, but he doesn't like practicing at home. I guess we'll have to work on making that more fun and not a chore! His prizes from the contest included some new painting supplies, so maybe that will help motivate him--this week anyways! I have discovered a magazine that I had never heard of before (it is only a couple of years old) which focuses on home machine quilting and is very good. It has been coming out quarterly but I understand that now they will be combining it with their longarm quilting magazine and publishing it every other month (I think they have shared articles in the past anyways). The magazine is called Machine Quilting Unlimited and I think it has some of the best articles about quilting that I have seen. It is not on any of our newsstands around here, but the website is www.mqumag.com. I ordered all of the back issues and have thoroughly enjoyed them. Very informative, in-depth articles with lots of good pictures. If you do your own quilting it is definitely a worthwhile read. As one who does all my own quilting on a Pfaff machine, I highly recommend it. By the way, at the bottom of this page I always have a photo of one of my quilts and I change it every once in a while, so scroll down and take a look!